This book provides an evaluation of the science and policy debates on climate change and offers a reframing of the challenges they pose, as understood by key international experts and players in the field. It also gives an important and original perspective on interpreting climate action and provides compelling evidence of the weakness of arguments that frame climate policy as a win-or-lose situation. 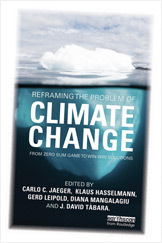 At the same time, the book goes beyond providing yet another description of climate change trends and policy processes. Its goal is to make available, in a series of in-depth reflections and insights by key international figures representing science, business, finance and civil society, what is really needed to link knowledge to action. Different contributions convincingly show that it is time – and possible – to reframe the climate debate in a completely new light, perhaps as a system transformative attractor for new green growth, sustainable development, and technological innovation. Reframing the Problem of Climate Change reflects a deep belief that dealing with climate change does not have to be a zero sum game, with winners and losers. The contributors argue that our societies can learn to respond to the challenge it presents and avoid both human suffering and large scale destruction of ecosystems; and that this does not necessarily require economic sacrifice. Therefore, it is vital reading for students, academics and policy makers involved in the debate surrounding climate change.